The stuff that the ivy excretes that causes the problem is an oil, that can be easily transferred to your skin (from the plant, pets, tools, clothing and footwear), and can be ‘volatilised’ (evaporated) with heat. The Leaves, stems, and even roots of the plant can give off the oil. Washing in water or alcohol won’t help. Detergents and, to some extent, other oils will. They're perennials with woody stems. 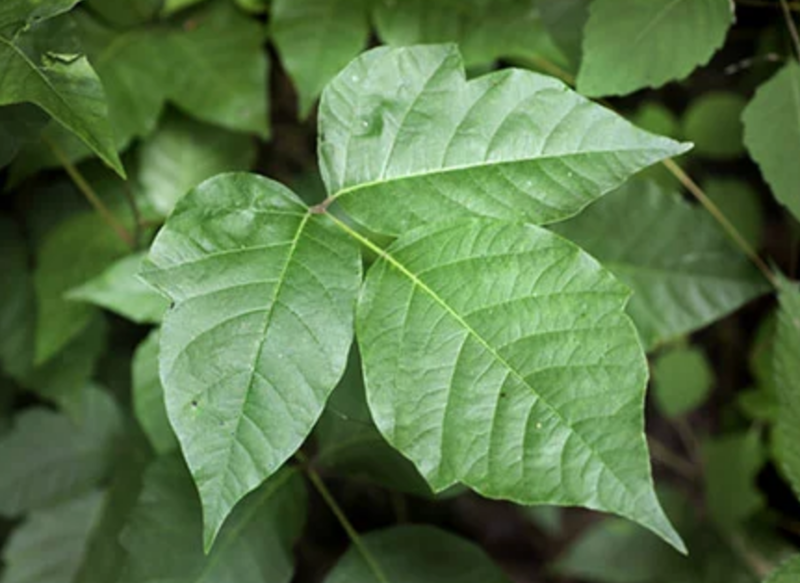 Poison ivy can have a lot of variation in leaf size, shape and colour, (note the leaf is always made up of three leaflets, with the middle leaflet’s stem being longer than the other two), and the plant can also assume a number of shapes: short ground-hugging plants, taller bushes, and even taller vines growing up a tree. There is no poison oak in Ontario (BC is the only province to be so lucky), and any reports of you may have heard of seeing it in Ontario are a case of mistaken identity. When you find yourself suddenly looking down (as I have once or twice), and finally notice you're in a whole field of the stuff, and can't see how you got in (or how you'll get out), what should you do? First off, don't panic. You have around four hours to clean up. Because it's an oil, it can be removed by detergent. (e.g. Laundry detergent and even dish soap). Scrub as if you were covered in axle-grease: Long and hard. Don't worry about the harsh soap on your skin, you can apply had-cream or something later — it won't be as bad as the rash. Clothing should be washed with hot water and plenty of detergent, footwear likewise (see other article re boot care). Tools should be wiped with detergent-soaked cloth, dried, and wiped with a rag and oil. Wear gloves and dispose of them and the rags in a plastic bag. Do not burn them! Take a short, lukewarm oatmeal bath. You can use a solution bought at the drug store or follow directions in this link. Take a lukewarm bath and add 1 cup of baking soda to the bath water. Take a short, cool shower. Apply a cool compress (wash cloth dampened with cold water) to the itchy skin. Don't use a topical antihistamine, which could worsen the rash. But do take an oral antihistamine.